Zakłady Mięsne Łuków is one of the oldest manufacturers of cold cuts and tinned meats in Poland. For over 40 years, we have been creating excellent quality products with a taste that delights consumers all over the world. 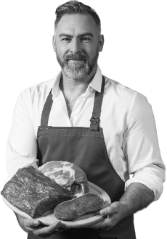 What we have to share with others are our extensive experience, long-standing tradition and tried and tested recipes enjoyed by generations of customers. The secret behind our products are regional flavours and local recipes kept for generations. All this, combined with the purity of the region, allows us to bring out the excellent taste, which has remained unchanged for long, long years. Łmeat-Łuków was esablished in 1973. Afterwards, the new plant belonged to the Regional Meat Industry Enterprise and was recognised as one of the largest plants in Europe. After the territorial reform, Łmeat-Łuków became a part of the Meat Industry Enterprise in Warsaw. 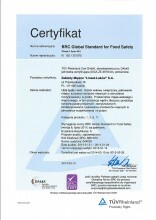 The Regional Meat Industry Enterprise in Łuków consisted of the newly-established meat processing plant in Sokolow Podlaski and the production department in Garwolin. A characteristic blue and red logotype of Łmeat-Łuków was registered in the Patent Office of the Republic of Poland. That year, three well-known politicians visited our company, i.e. Jan Olszewski, Prime Minister Józef Oleksy, and the President of the Republic of Poland - Lech Wałęsa. The plant was transformed into a one-member joint stock company entirely owned by the State Treasury. Privatisation of plants - the majority of shares purchased by Farmutil S.A. In 2017, Zakłady Mięsne Łuków are introducing a new logo to highlight the brand values that Łuków have cherished for over 40 years. The Łuków plant, located near the border of the Podlasie region, has been embedded in the Eastern Poland landscape for many years, drawing from local recipes. The natural resources of this green region, composition of the best ingredients, traditional recipes and a true passion are the foundation allowing us to create an excellent taste enjoyed by generations. 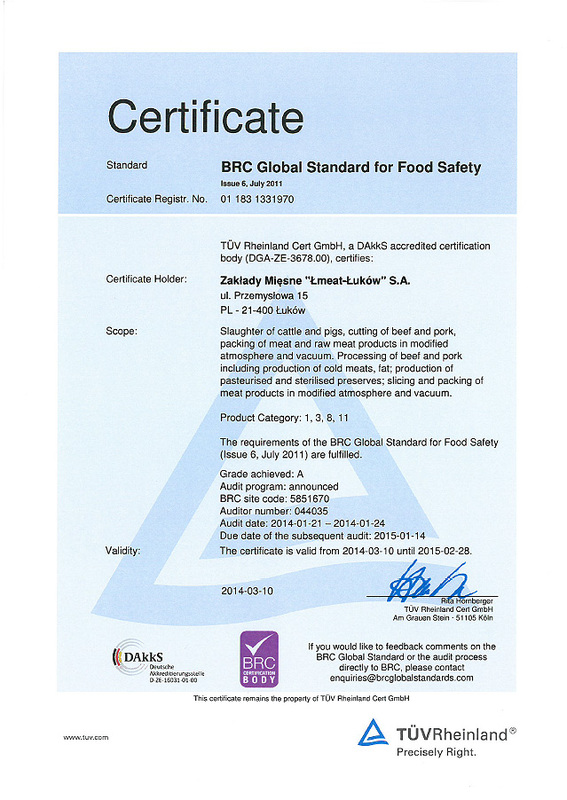 BRC Global Standard for Food Safety Certification – Issue 6 granted by TUV Rheinland in respect of slaughter and cutting of beef and pork, meat processing and storage of meat and meat products. 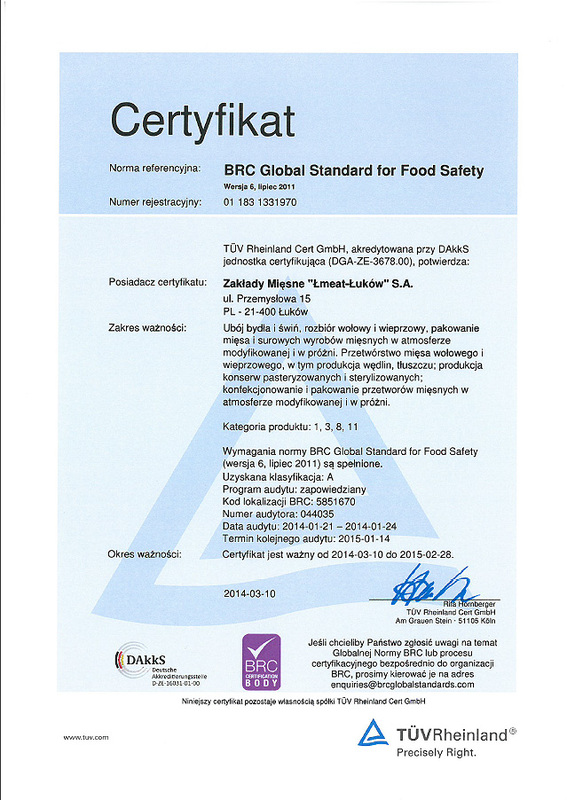 BRC Global Standard for Food Safety Certification – Issue 6 granted by TUV Rheinland in respect of slaughter and cutting of beef and pork, meat processing and storage of meat and meat products – English version. Certificate of conformity with the McDonald's standard in respect of slaughter of beef and de-boned beef granted by SGS.